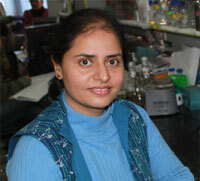 Jyoti Yadav actively participates in the Open Source Drug Discovery (OSDD) Program of CSIR. The OSDD aims to provide a platform for researchers, students and medical scientists to contribute their domain knowledge to the process of drug discovery for affordable medicine. She also co-ordinates scientific interactions at IGIB, inter-phasing with eminent international and national scientists visiting IGIB. Open Source Drug Discovery. Yadav, J. and Consortium, OSDD . Available from Nature Precedings. An Indian effort towards affordable drugs: "generic to designer drugs". Taneja, B., Yadav, J., Chakraborty, T. K., and Brahmachari, S. K. Biotechnol.J. 2009. 4, 348-360. Institute of Genomics and Integrative Biology, Mall Road, Delhi.